Southeast Asia’s internet economy is slated to be worth more than US$240 billion by 2025 according to a joint study by Google and Singapore’s Temasek Holdings covering the six most advanced internet economies in the region – Singapore, Malaysia, Indonesia, Thailand, Vietnam and the Philippines. Previous projections foresaw a US$200 billion internet economy for the region by 2025. However, that number has since been revised upwards by US$40 billion to US$240 billion thanks to drastic market acceleration in industries like e-commerce, online media, online travel and ride hailing. Rajan Anand, Google’s Vice President for Southeast Asia and India hailed this as an “extraordinary development” in Southeast Asia’s internet economy story. 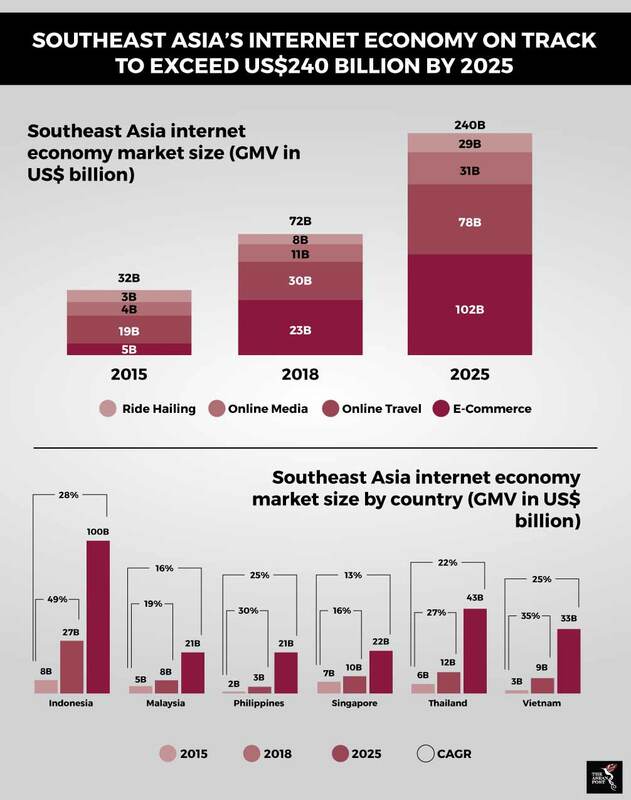 The report estimates that due to an increasingly engaged internet user base, Southeast Asia’s internet economy has reached US$72 billion in gross merchandise value (GMV) in 2018 across these industries. This represents a growth of 37 percent from the previous year and has accelerated beyond the 32 percent compounded annual growth rate (CAGR) recorded between 2015 and 2018. Southeast Asia’s internet economy has hit an inflection point. The primary reason for this is the region’s growing internet base. There are upwards of 350 million internet users spread across Indonesia, Malaysia, Singapore, the Philippines and Vietnam as of June 2018 – 90 million more users than in 2015. On top of that, more than 90 percent of people in the region get online access via their smartphones, making Southeast Asia one of the most dominant mobile-first internet regions in the world. The GMV of the internet economy currently stands at 2.8 percent of regional gross domestic product (GDP) up from 1.3 percent in 2015. This number is projected to exceed eight percent by 2025. For now, Southeast Asia is still trailing almost 10 years behind the United States (US), where the GMV of the internet economy there had already accounted for 6.5 percent of GDP back in 2016. However, this gap, has started to narrow. The most dynamic sector of the internet economy over the past three years has been e-commerce. Accounting in 2015 for about US$5.5 billion in GMV, it has since quadrupled, exceeding US$23 billion in 2018. Moreover, given the growing trend of consumer trust in e-commerce players in the region, the sector is set to be worth US$102 billion by 2025. “2018 has been the year for e-commerce in Southeast Asia. This has been driven mostly by the top three players in the region – Lazada, Shopee and Tokopedia,” Anand explained in a briefing on the report. He added that the region’s e-commerce market is almost as large as India’s but the additional advantage for Southeast Asia is that it has a higher per capita GDP translating to a higher disposable income. The superior spending power of individuals in Southeast Asia therefore is good news for e-commerce players in the region. Additionally, new sectors like online vacation rentals, online food delivery as well as subscription music and video on demand will contribute towards growth in the regional internet economy. The internet economy in Southeast Asia has also experienced dramatic growth in fundraising over the past four years. In 2015, funding by venture capitalists, private equities and corporate investors crossed the US$1 billion mark. On the back of this milestone, investments have surged at an exponential pace. Funding for internet economy companies have since quadrupled in 2016, when they raised US$4.7 billion. This further doubled in 2017 to US$9.4 billion. In 2018, the trend continued in an exponential fashion with US$9.1 billion being raised within the first half of the year alone. This brings the total capital raised by internet companies in the region to US$24 billion in less than four years. Following this trend, Southeast Asia is set to attract between US$40- to US$50 billion worth of investments which is required to build a robust internet economy by 2025. Southeast Asia’s nine unicorns – Bukalapak, Go-Jek, Grab, Lazada, Razer, Sea Group, Traveloka, Tokopedia, and VNG, have received the majority of funds attracting US$16 billion of the US$24 billion invested in the region. However, investors have also taken notice of smaller players and are pouring record amounts of funds into them. Over 2,000 internet companies in the region have secured investments. Companies valued at below US$1 billion have raised a collective US$7 billion in the last three years. The most dynamic segment has been companies valued between US$10 million and US$100 million. Such companies are often the bedrock of the internet economy and have raised US$1.4 billion in the first half of 2018 alone – surpassing the US$1 billion raised in 2017. The Google-Temasek report has long been viewed as the barometer of Southeast Asia’s digital economy. The 2018 report is the third edition with previous editions being released in 2017 and 2016, respectively.